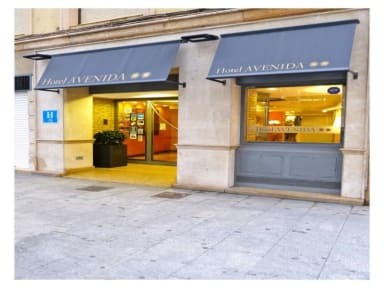 Hotel Avenida can be an ideal starting point from which to discover all that Zaragoza has to offer. All our rooms have free Wi-Fi and everything you need to make your stay as comfortable as possible. Local shops, bars, restaurants, and other interesting points can be easily reached on foot. The hotel is located in the historic heart of Zaragoza, in a cheerful environment full of life, surrounded by local shops, with an important cultural activity and lots to things to visit (museums, theaters, churches, stately buildings, ancient Renaissance palaces). The best tapas bars of Zaragoza ('El Tubo' - The Tube) and the main attractions of the city (Basilica del Pilar, Seo Cathedral, Roman Theater, Goya Museum, Romans Museums, ...) are a 5 minute walk away. If you want to know the best of Zaragoza, this is your place. The Basilica of El Pilar and La Seo Cathedral are situated 3 minutes on foot away. Hotel Avenida has 91 full equipped rooms. All the rooms has en suite bathrooms, flat-screen TV, air conditioning & heating, telephone, working desk, hairdryer and toiletries, wake-up calls and Free Wi-Fi. Sooooooooooooooooo good! It's a 2-star hotel downtown Zaragoza. Compact room with double bed and it's own bathroom. I stayed at 5th floor and I had a small surprise: a nice balcony with fake grass and a table to see the stars at night. Francisco - one of the concierges - was VERY KIND. Very helpful, he gave me directions concerning restaurants, cafeterias, museums...and what kind of typical candies I should eat near the hotel. The breakfast room is SO, SO, SOOOOOO cute! This place was great - just a lovely hotel, would not call it a hostel. The front desk was super helpful. The location was PERFECT, within walking distance of some of the best parts of the city. 10/10 recommend. The staff was very kind. Room was small, but clean. Location was great, easy access by bus front Delicias, and within walking distance of all the major sights! 10/10, fantastic clean hotel situated in the central with beautiful attraction. tram stop in front Perfect reception, English speaking too,l to reduce every worries and stress level on arrival. Accommodating no matter the time of your arrival. World class breakfast and service to accompany it, fit for adult and children. bathroom excellent Cleanliness is outstanding and everywhere is sparkling, own TV, wifi, in spacious lounge 2relax, room gives you a sound sleep never to forget in a hurry. Great stay in Zaragoza at Avenida. The staff were friendly and helpful. Beds were comfortable, even the cot! Clean and nice bathroom and perfect central location. Good hotel for the price! Basic, but good location, beds are comfy, clean and secure. Very basic, which was what I expected for cheapest room. Was a questionable hair in shower but not the end of the world rinsed it down the drain. Location was good but no information about city available (probably due to my limited ability to speak the language). Good location. Tiny rooms but well kept. Good breakfast.